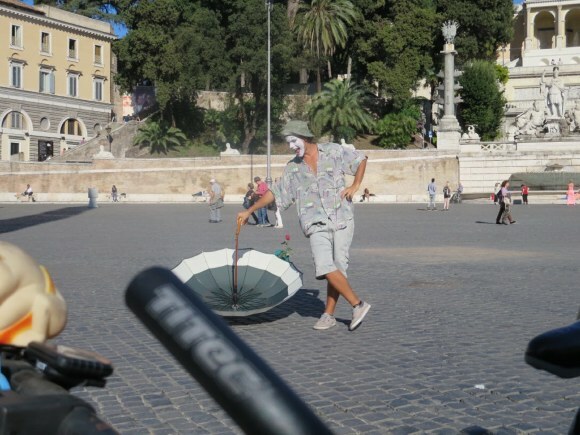 The annual trip to Rome this year featured some day trips to places we had not been to for a couple of years, lots of demonstrations and the rebirth of the Rome Hash House Harriers. Biking Paul: Our first visitors this year were Paul and Laura. Paul is a biking friend and Laura is his friend who was here for a meeting. 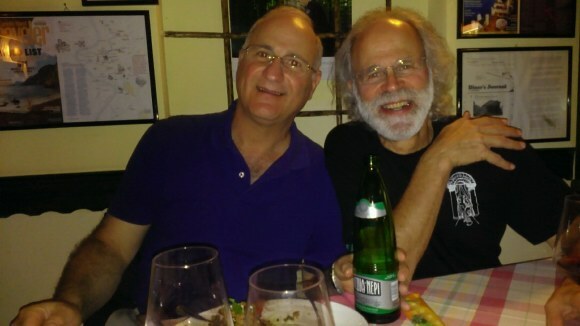 We went to Taverna Fori Imperiali. Alla and Yan: Alla and Yan visited us on their way to a cruise. They are both Russian émigrés who we know through a young lady who worked in Hynda’s lab. 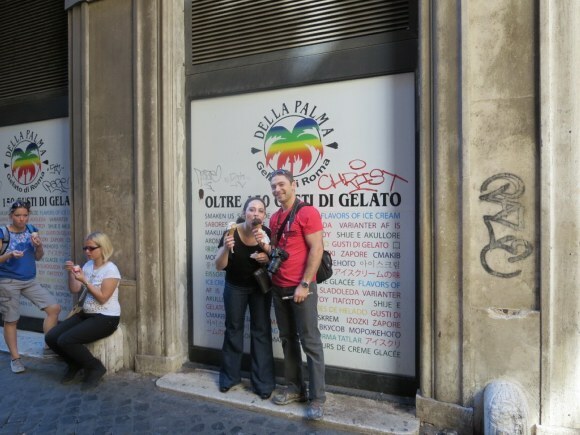 We took them to Della Parma, the usual gelato stop near the Pantheon with 27 varieties of chocolate among their 150 flavors. Lorenzo Picante: In Italy when we make reservations at a restaurant they have a hard time with Hynda and Nolan so we use the name Lorenzo. Since I like my food ‘molte picante’, I have become Lorenzo Picante. 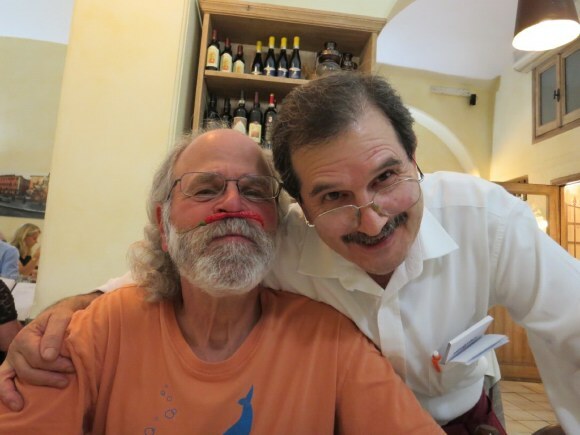 Salvatore, at Lampada, gave me my own how pepper and we took this picture together. 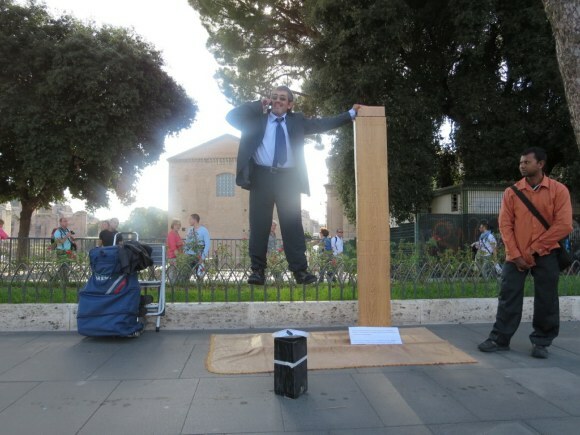 Street Performer: I felt sorry for this guy in Piazza Popolo. No matter how hard he tried he could not get a crowd together to do his act. I have no idea what it was he would do if he got enough people to stop and watch. The Magic Buddhas: Last year’s gimmick among the vendors was men dressed in orange robes with one suspended above the other in a seemingly impossible display of strength. 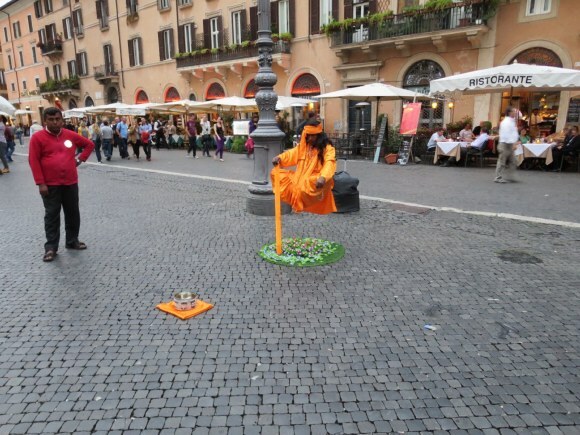 This year in an economy move they have reduced the number of people doing this and where last year we saw them all over the city – this year we only saw one at Piazza Navonna. The other change was that there is only one person involved now and he is seemingly suspended in midair. Cell Phone Man: So the orange Buddha guys have been replaced in some places by this guy in a suit suspended in midair by magic.